Feldman's Aquarium Maintenance Installs and Maintains Fresh & Salt Water Aquariums and Outdoor Ponds. Contact Owner Jeff Feldman at 813•685•0394 for your appointment. Feldman's Aquarium Maintenance has been installing and maintaining salt water aquariums in the Tampa Bay Florida area since 1992. We offer a variety of Aquarium Maintenance Services in the Hillsborogh County to keep your fresh water aquarium, saltwater aquarium, or reef tank healthy, thriving, and looking its best. Our success with aquariums starts with decades of experience and knowledge in maintaining freshwater aquariums, saltwater aquariums, and reef tanks. One of the most important keys to our success is superior water quality. The lifeblood of any aquarium. We always use only Reverse Osmosis De-Ionized water when servicing or installing Reef Tanks, Marine Aquariums, and Freshwater Aquariums. We offer only the best products to our clients and their Aquariums. 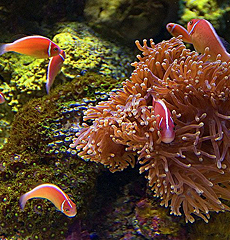 Whether your need is an Aquarium Cleaning, Freshwater Aquarium Maintenance, or Salt Water Maintenance, or you are interested in a new Freshwater Aquarium, Salt Water Aquarium, or Reef Tank in your office or home, Feldman's Aquarium Maintenance is the best choice you can make in the Tampa FL vicinity. We know what we are doing and will make sure you never need to find another Hillsborough County fish tank company. We want every customer to feel like they are our only customer. Jeff Feldman is the owner and will personally set up and/or maintain your fresh water fish tank on a monthly, bi-monthly or as needed basis. Jeff will make sure it's done right the first time - every time.